With the sun always shining in all its glory, SUMMER is undeniably here. Though we do get a lot of sunshine all-year round, now is the time to give our skin the extra TLC it needs to keep it protected from the blistering heat and dryness. We need something that can protect us from the harmful UVA and UVB rays, keep us moisturized without the icky sticky-feel and still help us lighten and even out the skin. Don't worry, you need not apply 3 or more different types of lotions for those needs. 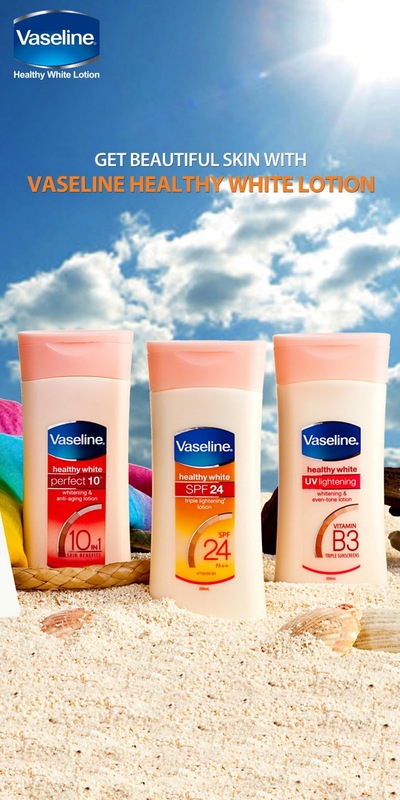 Now, getting all three is possible with Vaseline's Healthy White SPF 24. Truly, Vaseline Healthy White SPF24 is the only lotion you'll need this summer. Just remember to reapply if you'd be exposed under the sun for longer hours. I swear, you'd love how light it feels on the skin! With the help of Vaseline Healthy White SPF24, you can continue to have a great time under the sun wearing your best summer getup without having to worry about getting sun burns and premature skin aging. Besides, summer is the best time to show some skin, and with Vaseline Healthy White SPF24, you know you'll have that flaunt-worthy skin that's also protected. And to show how much Vaseline wants us to enjoy our summer, the brand launched SUMMER SKIN + STYLE: The Vaseline Lookbook Promo. All you have to do is to share your best summer fashion looks and get a chance to win iPad minis, Forever 21 GCs and a Boracay getaway trip for 4! So what are you waiting for? Grab your coolest summer outfits and start working it in front of the cam! Stay gorgeous, my loves and enjoy the weekend!